Why did we write this book? And why do you want to read it? Search for books on radio advertising and you'll find two types. One type is the academic volume that goes deep into the nuts and bolts of theory and media formulas, none of which was developed by people required to deliver a profit for their customers. The other type, written by radio salespeople, hits you hard with subjective and biased puffery about why you should advertise on radio. Neither of these is useful to someone who wants to understand radio advertising and receive guidance about the actions that produce the best, most profitable business results. Radio advertising is intriguing because it is so underrated, so overlooked. TV and print advertising are infinitely sexier than radio. They're visible, and they're tangible. However, on important dimensions of cost, targetability, and reach, radio outperforms the marquee mediums of TV and print. More recently, online advertising has gained traction andlarger portions of advertising budgets, yet it functions more as a demand capture medium and doesn't match radio when it comes to demand generation. Yet in spite of the momentum against it, radio advertising delivers the goods as perhaps the most efficient medium that quickly and inexpensively reaches 94% of the US population over twelve years old. In fact, three of the top ten radio advertisers in 2005 were TV networks-ABC, CBS, and Fox (according to Media Monitors, LLC). Yes, radio advertising works so well that even TV networks use it to boost TV audience size. So the story about radio advertising is one of how the emotional desire for tangible, sexier advertising overwhelms the rational need for achieving business objectives. It's a classic case of crossed wires. And that spells opportunity for the businesspeople who can uncross them and see radio for what it is (and, of course, isn't). However, if the uncrossing of wires were the whole story, we wouldn't have written this book. It turns out that many have tried radio advertising and decided, "It doesn't work for us." The nexus of this book came last year at a direct response industry event where we heard the same story a number of times within a short period. The basic theme was, "We tried radio advertising and it didn't work for us." If you heard this once, you'd just say, "Well, OK, radio can't work for everybody." But after the third person said the same thing, we started to ask more questions about these situations where radio "didn't work." We found out that the radio tests-if you can call them tests-these people conducted were doomed to fail because they followed few, if any, of the fundamentals of what we've learned works in direct response radio. In all three cases, and most others we've heard since, these intelligent, successful businesses turned to their current general agency to "test" radio. It turns out all general agencies say yes when you ask if they "do radio," even though they don't have an expertise in radio. Why? Because they don't want to lose the client to another agency. So the agency approaches radio advertising the same way it does TV, print, and online because that's all the agency knows. Now think about what happens when radio fails (because it will, if you approach it the same way as TV or print or online). The general agency can point to that failed test and say, "TV is where you need to be," and radio advertising is never again considered. How convenient. Convenient, that is, for the general agency that would rather do more glamorous and much more profitable (for the agency) TV work. 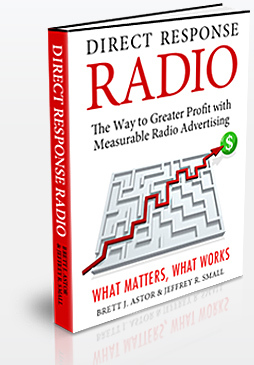 Creating a profitable radio advertising campaign isn't easy. The way to success is not obvious. Unlike TV, which provides both visual and auditory information, and print, which provides static visual information, radio is one dimensional and fleeting. As a result, radio requires a different, perhaps broader and more nuanced, skill set than TV or print or even online advertising. Radio is often called the "theater of the mind," and advertising successfully on the radio requires a solid understanding of how the human mind processes auditory information-information that is often delivered in the midst of other stimuli. If you speak to radio advertising industry sales representatives about advertising with them, you'll get spiffy sales pitches and some fancy graphs and charts with impressive rankings. They'll make it sound easy. We find it unfortunate that the radio industry-the owners of radio stations and radio networks-has chosen this shortsighted approach that takes the money but leaves the needs of radio advertisers (their paying customers) completely unmet. A victim of an outdated, sales-driven mentality, the radio industry is focused solely on increasing listenership numbers, looking shortsightedly toward each season's new Arbitron numbers much the way public companies manage their stock prices by dancing with Wall Street's quarterly expectations. Nowhere does the radio industry provide information about what actually works in radio advertising.